I was driving around today, taking advantage of a little daylight and a break in the rain when I spotted this building up on the hill. I hadn’t noticed it before, but it looked interesting so I figured out how to get there. Oh! It is Oakland School! I wondered where that was. It is a 8th – 12th grade alternative school for Tacoma students. 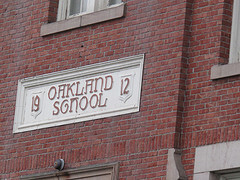 Oakland School (3319 S. Adams Street) was built in 1912 by Heath and Gove and qualifies for, but is not yet on, the local register of historic places. The architect was F. H. Heath, who was also the architect for Stadium High School, Lincoln High School, Pythian Temple (all in Tacoma) and Paradise Inn at Mt. Rainier. The architectural style is Jacobean Gothic. Per Wikipedia, the school served elementary students until 1988, at which time it became an alternative school for high school students. During 2009-10, approximately 250 students attended Oakland. OHS also added a middle school component in the 2009-10 school year. According to the Washington State Report Card, the school has 235 students, with more boys (58%) than girls. The annual drop out rate is 43%, which is dramatically higher than the 7% figure for the district as a whole. The program at Oakland is designed to meet the needs of students struggling with traditional high school, through an alternative schedule and small school environment. This entry was posted in Historic Sites, Schools, Tacoma, WA State - Pierce County and tagged drop out rate, F. H. Heath, Heath and Gove, high school, historic register, Jacobean Gothic, Oakland Alternative School, Oakland School, Washington State Report Card on December 12, 2010 by admin.